Street style Milan 2012 is always sleek and oh so feminine. 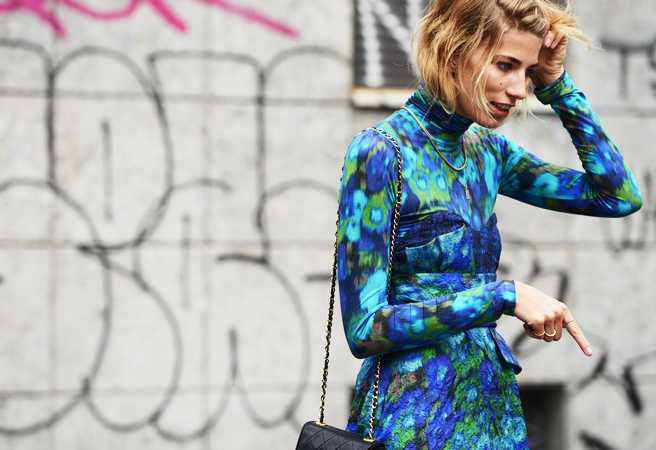 There is always a wonderful influx of florals and graphic prints on the streets. A daring sense of boldness and individuality. Fearlessness with colour and their style. Something which is highly commendable in a day of fast fashion and vast imitations. This is what I love most about Street style Milan 2012. The undeniable fearlessness with colour, print and texture. How could one not be in utter admiration? Because the playfulness in Street style Milan 2012 is seriously contagious. Much like the city itself, a playground for all things unique and enthralling; the Italian dolce vita. Air thick with delicious scents like gelato an lemons and luxury fabrics adorning people from all walks of life. Another thing I can’t help but note is how these vintage inspired bicycles keep showing up lately. Is it just me or is the Universe trying to hint at me in a not so discreet fashion? Seriously, the impulse to finally purchase one grows stronger and stronger, day by day.